Individuals are encouraged to share ideas and gather support from others managing similar brain tumor issues. During this peer support group, people with breast cancer can share their experiences and emotions. Sponsored by Join the Journey. This support group offers a meeting place for families of children with cancer to share experiences, meet others facing similar challenges and gain strength from one another. A light meal is served, organized activities are provided for children, and adults have time to share with one another in a private and safe setting. 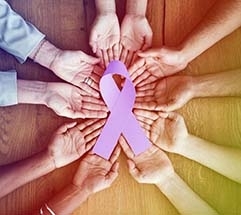 This support group is for patients with melanoma and their family members/caregivers. Join us to learn about melanoma from guest speakers and share experiences with each other. Refreshments are provided. Individuals with multiple myeloma and their families are encouraged to attend this informal support group. Individuals with prostate cancer and their families are invited to this support group, which includes informal discussions and speakers. This support group offers a meeting place for families who have experienced the loss of a child to cancer. It encourages families to share experiences, meet others facing similar challenges, and gain strength from one another. Each meeting is facilitated by a professional grief therapist and a light meal is provided. This support group focuses on topics relevant to young women who have been diagnosed with breast cancer. It is an opportunity to meet other young breast cancer survivors, and gain strength from one another. It is co-facilitated by a nurse from Mayo Clinic and a breast cancer survivor. Sponsored by Join the Journey.